DIN Standards are invented for a variety of components including industrial fasteners as DIN 7337 Blind Rivets. DIN 7337 Rivets are manufactured from Carbon Steel, Stainless Steel Grade A2 or A4, Brass, Alloy Steel, Plain Steel, Copper, Aluminium or many other materials. DIN 7337 Rivets are available in a wide range of sizes, shapes and materials. DIN 7337 Rivets refer to an exhaust type and performs an inseparable connection of sold materials and strong solid work pieces. DIN 7337 Exhaust Rivets consisting of an elongated aluminium rod and a carbon steel with an exhaust element inside. 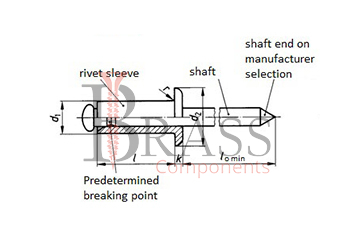 The design features consist of a sleeve and a rod. The distinctive feature of DIN 7337 Rivet is a Flat Shoulder. Increase the strength of the joint at high operating loads. Combination of combined elements made of different materials. Complies GOST 10299-80 and GOST R 15973-2005. Wide range if rivets sizes increase the versatility of its application. Maintains basic performance in aggressive environments. Fastening allows to create strong connection which are stable during operation of dynamic loads. To create a connection, a special riveter, manual or automated tool is used. The bonding of materials takes place by grasping the rod and pulling it out of the sleeve, which results in flaring and a strong connection. Widely used in Instrument Making, Machine Building and many other manufacturing industries for permanent fastening of thin-materials or assembly of structures. Mainly used for permanent fixing of sheet metal materials. Provides a hermetic and strong connection of the structure, subject to high vibration loads, including with aerodynamic action. Designed to create a mechanical one-piece connection of two or more flat shaped parts in conditions where access to the connection during installation. 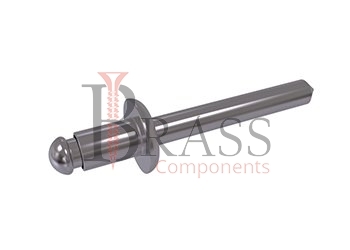 We manufacture DIN 7337 Rivets as per Custom Specification and export in Germany, Sweden, Denmark, Norway, Russia, France and other European Countries. For more Information, Please Contact Us or Inquiry Now.